(Tianya) Newspapers Carrying Suning Advertisements Were Bought Up During Golden Week. September 30, 2007. The shopping week of the October 1 national day celebration is about to go into full gear, with the toughest competition being expected in consumer electrical appliances. Apart from the regular sales and marketing methods of advertisements, news, service and price wars, there have also been some unusual irregular methods. The day before October 1 is when the big advertisers poured their money to advertise their products. The electrical appliance advertisers will pay for dozens of full-page advertisements in the mainstream newspapers. This year is no exception. But when the citizens woke up this morning, they could not find any copies of the best-selling Beijing Times. Mrs. Lee who lives at Beitaipingzhuang woke up early morning and wanted to purchase a copy of her regular newspapers, Beijing Times, in order to check out the latest sales activities. But the kiosk operator informed her that all copies of Beijing Times were taken. She went to three other kiosks in the neighborhood and found the same thing. She was perplexed. 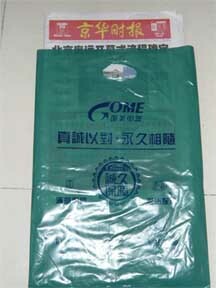 The reporter investigated the situation and found out that the copies of Beijing Times were bought and then taken to a certain well-known consumer electrical appliance store chain (note: the photographs above show the newspapers being placed in bags with the logo of the Gome store chain) where they are being distributed for free. But the big difference is that the dozen or so pages of Suning Electronics advertisements in the newspaper were removed. Instead, they were replaced by this other store chain's advertisement insert. A kiosk operator said: "Someone is trying to prevent the readers from seeing the Suning advertisements!" Manager Yue of Suning's Daqing store was the first to heard about the news. On the evening of September 29, she received a SMS from a salesperson who wrote that colleagues have claimed that "not a single copy of any newspaper with Suning advertisements will show up in Beijing." It was also said that people have been assigned to cover every kiosk in every district in order to guarantee complete coverage. Manager Yue was dubious around the veracity of the tip. Nevertheless, she went to check out the kiosk near her store early on the morning of September 30. When she got to the kiosk, she found out that the operator did not have any copies of Beijing Times for retail. When people asked the kiosk operator, the reply was that all copies had been reserved on the day before. 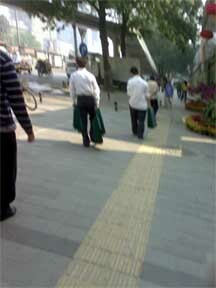 Shortly afterwards, two women came and took all the copies of Beijing Times. They also took away several dozen copies of other newspapers that carried Suning advertisements. Once Manager Yue observed this irregular situation, she immediately called the Northern China Regional Management Office of Suning. She also assigned sales persons to check out 12 other kiosks near the Daqing store. She found out that at 10 of the kiosks, the copies of Beijing Times had been bought up by unidentified persons; at the other 2 kiosks, the copies of Beijing Times have been reserved but not yet taken away. Manager Xu of the Suning Beijing marketing department said that Suning invested a lot of money and resources for the October 1st period. They had planned and prepared carefully with a sales campaign that carried unprecedented product range and price cuts, and they were confident that they would win the battle of October 1st. Therefore, the advertising campaign was also unprecedented with several dozen full page ads, including 13 full-page advertisements in Beijing Times alone. Upon receiving the input from the Daqing store, the Suning Beijing team organized their employees to investigate the status of the kiosks around the almost 40 Suning stores in Beijing. The same thing was happening everywhere, with unidentified persons reserving the newspapers with the kiosk operators on the day before and taking the newspaper copies away. This was especially true in the neighborhood of the Suning flagship store in Beitaiping. Beijing Times distribution center general manager Jin Feng received the information at around 10am: At each large Beijing Times sales point, unknown persons were buying all copies of the newspapers at 1 yuan/copy. ... The reporter managed to contact a person who participated in the activity to buy the newspaper copies. This person asked to remain anonymous. He said that all store employees were told on September 29 to proceed to designated kiosk and buy all the copies of Beijing Times. Their mission was to check out the situation and make the purchases. They were told that all expenses would be reimbursed. If a kiosk operator should demand more money, they were told that they could pay 1 yuan/copy, up from the usual 0.5 yuan/copy. In order to guarantee that all points were covered, they even have people following the delivery persons to see if there are any kiosks that they were unaware of. He said that their supervisor said directly: "The Suning advertisements must not be available on October 1st! We will spend a few hundred thousand yuan in order to cancel their million yuan advertising campaign! It is worth the money!" The State Council Development Research Center deputy director Lu Yanbo said that Suning is about to open its northern China flagship store at Beitaiping. In September, Suning had opened three more stores in Beijing, and they were clearly ascendant in terms of expansion rate and product quality. Suning was hoping to use October 1 to do even better. But their competitors are using extreme methods. He said that such deliberate buyouts of newspaper copies have previously occurred before, given that there is no legal restrictions. But he said that it was foolish to use methods which "hurt others without benefiting oneself." 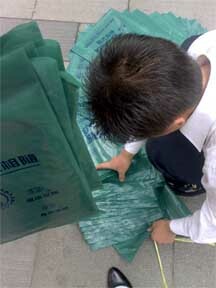 The Beijing Times distribution center general manager Jin Feng was angry about the deliberate buy-out of his newspaper. They are investigating and collecting evidence, and they may seek legal redress. On September 30, Beijing Times made an extra print run of 30,000 copies and rushed them out that afternoon in order to protect the rights of the advertisers and consumers.